We interrupt this recipe station for a quick commercial. 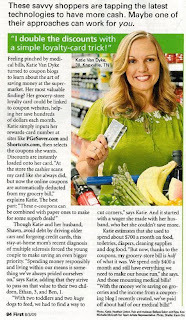 If you are looking for ways to save money on groceries and the like, you must check out my friend, Katie's, website. She is featured in the August edition of First for Women. It's fun to pick up a national magazine and see a friend featured.